• Hole #1: The green complex and approach was modified so that well-played shots finish on the putting surface. This was accomplished by slightly softening the right to left slope short and right of the green. Fill material was added to slightly raise the center of the backside of the catch basin to the left of the putting green. • Hole #3: Modifications were made to the back teeing ground in order to gain more tee space and improve spectator circulation patterns. As a result, the Soundview Trail was relocated behind the #3 tee, and the dunes behind the existing back tee were leveled in order to create a grass walkway for spectators between holes #3 and #11. The player walkway to the 4th tee will be to the right of the green, and the dunes between the 3rd green and 11th green will be softened to facilitate player movement, coinciding with a proposed player bridge located left of the 11th green. • Hole #4/6: The dunes to the right of the #4 forward tee were removed and/or reshaped and tied in with the new #6 tee. The pathway behind #6 tee will be re-routed along with the existing maintenance road to the right of the tee, closer to the 11th green. In conjunction with this work, the entire north-end pathway, which runs to the left of the 15th hole to the #16 tee, was widened to facilitate spectator circulation. • Hole #7: The green complex has been modified so that more shots finish on the green surface, rather than going long. The approach area has been modified so that shots short of the green stay within 50 yards of green and do not filter into concentrated collection areas. • Hole #8: Softening of left side fairway and approach to green combined with slight widening of right fairway edge to allow properly played shots to finish on or near the green. • Hole #13: The green complex was modified so that there is more pinnable space and more second shots finish on the putting surface. The green was enlarged and re-designed so that bounce-in shots can be played. • Hole #18: The cross bunker in the par 4 drive zone was expanded roughly 7 paces further to the player’s left, and an additional bunker was constructed in the par 5 second shot landing zone. 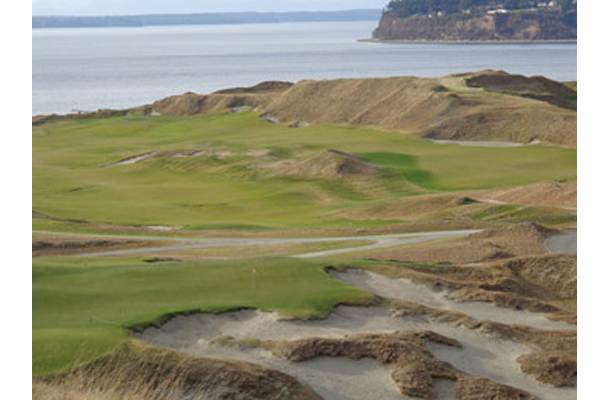 Chambers Bay remains open to the public and now takes on a new look as the changes are all now complete. The first round of the 2015 United States Open is set for June 28, 2015 but between now and then, the course welcomes the public to see the new changes and challenge a course that will host the world’s best players.